In this exquisitely decorated two bedroom condo, each room has a state of the art split A/C unit, ceiling fans, cable TV, IPod docking station and 3 private bathrooms, two bathrooms have walk-in-showers, each bathroom is equipped with a hair dryer. (Homweaway #239506, #4608679, #4610859, #4620637). Also: a big bin of water toys, sand & beach toys for the kids to enjoy. The condo contains one king, two queens, one drop-down queen Murphy bed, and a twin inflatable mattress with built in inflate/deflate pump. Central to the condo is a fully equipped renovated kitchen with breakfast bar, dining area, and living room. The condo includes three private furnished balconies with views of beach and ocean. As a direct guest of the owner (through this website), you will be provided the best rates and a private check-in that allows you to bypass the front-desk process. All linens are provided. On site amenities include, Tennis, Spa, and the beautiful Elysian Pool and Hot Tub. The resort is just two miles from Red Hook, the center of St. Thomas's popular east end activity and ferry transports to the other nearby islands. The Resort: Come and enjoy the exclusive and immaculately manicured Elysian Beach Resort where the aqua blue Caribbean water of Cowpet Bay will be ever present in your views from the living room, the bedrooms, or any one of the three private balconies of this exquisite condo. The Elysian is located just 12.5 scenic miles from the Cyril E. King airport (STT) on the east end of St. Thomas where it rises from its secluded beach to offer a most magnificent setting tucked quietly between the Ritz-Carlton and the St. Thomas Yacht Club. From the moment you enter the resort you will begin to relax as you discover that most all of your vacation needs can be satisfied just steps from the condo door, right on the premises. The Beach and the Elysian Pool and Hot Tub: Enjoy the beautifully secluded white sand beach, where, in the shade of the palm trees, you will find complimentary use of beach furniture and a sports concession stand that offers a variety of water toys such as paddle boats, single and double kayaks, windsurfers, float-mats, and snorkeling gear. For a change of scenery, with reading material in hand, consider spending an afternoon sitting at the Elysian freshwater swimming pool; one of the most exquisitely designed and landscaped pools on the island, complete with rock grotto waterfall and hot tub. Relaxing on the beach: Enjoy a quiet day on the beach while watch the iguanas sunbathing. Start your day with a fresh cup of coffee on one of the three balconies and get started on that book you've been wanting to read! If coffee and a book is not your style, consider a game of tennis on a court surrounded by palm trees. Hi. I am Nancy from nancys-vacation-rentals.com. As owner of these St Thomas Vacation Rentals, my goal is to provide beautiful accommodations in a world class location at an affordable price and to build a base of repeat clientele who view my vacation rentals as an extension of their lifestyle. All of my Nancy's Vacation Rentals on St Thomas are listed on VRBO & HomeAway: The Admiral - VRBO #4608679, HomeAway #4608679 The Brigadier - VRBO #239506, HomeAway #239506 The Captain - VRBO #238465, HomeAway #238465 The Ensign - VRBO #181754, HomeAway #208804 The Navigator - VRBO #4610859, HomeAway #4610859 Come join in the fun at my St Thomas Vacation Rentals! All of my Nancy's St Thomas Vacation Rentals are located on the East End of St Thomas in the exclusive and immaculately manicured Elysian Beach Resort where the aquablue Caribbean sea and white sands and palm trees of Cowpet Bay Beach are ever present in the views from the living room, the bedrooms, and each of the three private balconies of my St Thomas Vacation Rentals. Enclosed by palm-shaded hills and overlooking its own yacht-filled cove, my Nancy's St Thomas Vacation Rentals offer a magnificent setting. The Elysian Beach Resort is a beachfront resort that has just over 60 vacation units, each with multiple balconies that overlook the Caribbean. 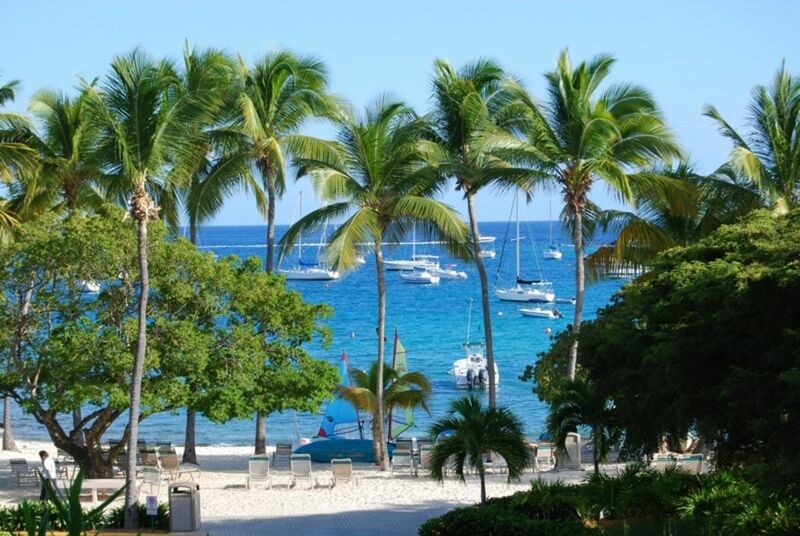 In addition to its own white-sandy beach, the Elysian Beach Resort has amenities to please everyone, including tennis, swimming, sailing, and snorkeling. After visiting many islands throughout the Caribbean, my husband and I settled on the Elysian Beach Resort on Cowpet Bay Beach because of the incredible variety of activities and sightseeing in the area, the beach, the pool, and the easy access to the many restaurants, nightlife, and boating options available in Red Hook. Come make one of my beachfront St Thomas Vacation Rentals on the East End your home base for your exploration of the Caribbean and the Virgin Islands! At nancys-vacation-rentals.com you can see the list of Activities that I and my family enjoy most. While staying at my Nancy's St Thomas Vacation Rentals by owner, you will discover that there is more to do than you possibly have time to enjoy. From beaching, scuba diving, snorkeling, snuba, ecotours, sailing, yachting, power boating, submarining, rafting, jet skiing, parasailing, kayaking, horseback riding, parasailing, duty free shopping, dining, imbibing, fishing, golfing, and tennis ... to visiting Paradise Point, Coral World, the St. Thomas Skyride ... to sight seeing ... to finding love and getting married ... or just relaxing and enjoying the view from the balcony of your Nancy's St Thomas Vacation Rentals at the Elysian Beach Resort on Cowpet Bay Beach, East End, St Thomas, USVI has it all to offer. There are so many things to do on the island of St Thomas USVI, but one of the really great things about being on the East End is that you have the ability to easily jump off of St Thomas and explore St John and the British Virgin Islands. Having been to St Thomas many times, over many years, I have developed a list of my favorite things to do. They are not to be missed! Ask me about my list! A more subtle benefit is the fact that the Elysian Beach Resort, unlike most other resorts on the island, is solidly constructed of concrete. It has survived two hurricanes and served as emergency housing. In other words, you can survive a hurricane here! There is a washer/dryer combination in the unit. There is also a laundry room with large capacity washers and dryers less than 100 yards from the condo. Our government-strength Wireless Internet extends throughout the condo, to the pool and to the beach! There are two restaurants and a Pool Bar on the property. The three are part of the St. Thomas Restaurant Group (STRG). The STRG includes these restaurants: The Caribbean Fish Market, Sangria's Beachside Bistro, The Pool Bar all on Elysian property. Pesce and Melt both in Red Hook. The Sunset Grill and The Cruzan Beach Bar at Secret Harbor and Zest Coffee and Frozen Yogurt in the Ritz. Our family of 6 recently enjoyed a great stay at Nancy's condo (B-unit). It was spacious and well appointed with a short walk to the pool and beach. The resort is conveniently located to the town of Red Hook (along with the ferry terminal to St. John) and the North/East Side beaches (Coki, Sapphire, Magens). The Elysian is a solid 3.5 star resort and it's tough to beat the value at this price point. The pool was recently redone after the hurricanes and is beautiful. The beach area offered good room for swimming with plenty of chairs. A few points to note...the pool bar and casual restaurant (Sangrias) are not open after sustaining damage in the hurricanes. If you are looking to be waited on poolside or at the beach this is not your place. However, there is a cooler at the condo (along with ice in the freezer) so you can pack your own drinks for the beach/pool. The other onsite restaurant (Caribbean Fish Market) is fine dining and opens at 5 (they serve Sunday brunch and the bar is open all day on Sunday (go figure!)). I strongly recommend renting a car for access to the markets and restaurants in town as well as trips to the other beaches. I would definitely stay here again if visiting St Thomas. Everything you need and want for a great vacation rental! Thank you Chris. We enjoyed having you as our guest. We hope you come back again to our beautiful Island and our condo. We enjoyed our stay and the gorgeous view. The pool is amazing! The condo layout is perfect, with three separate balconies, a wonderful common kitchen/living area and private bedrooms with individual bathrooms. The island continues to recover from hurricanes Irma and Maria and they've made tremendous progress. Sangria's restaurant was damaged and has not reopened and the kayak/toy rental hut was still being repaired, which is the only reason I gave 4 stars instead of 5. Red Hook is a short ride away and we found wonderful restaurants and stocked up on some groceries at Moe's. Nancy was great to work with and responded to questions in a timely manner. We enjoyed our stay very much and hope to return very soon! Elysian Beach Resort was nice and relaxing. Nancy's property is exactly how it is described. The condo was clean, and in a great location. Quiet with beautiful views from all three balconies. She is quick to respond to any questions that you may have. It has all of the amenities that your home would have. We also loved having the two restaurants on the property within walking distance, Sangria's for something quick and The Caribbean Fish Market which had awesome food and desserts! Buck our waiter drew us back a second time for dinner. He made our visit very pleasurable. All of the staff there were very friendly and attentive. We took an island tour of St. John which is a must. Beautiful island!! Sunfari Adventures' Mickey Rose did an awesome job of showing us the island. We visited Trunk Bay, Hawks Nest Bay, Cruz Bay along with snorkeling and paddle boarding at Maho Bay. We enjoyed our visit very much. I know Hurricane Irma did a great deal of damage, and it really broke my heart after getting acquainted with the people there. But just from being there a short time I know the people who live on St. Thomas have that singular ability to pull together in a crisis, and the human spirit is very strong. Beautiful place! Great condo with nice view of the ocean! Nancy was great to work with and the condo was perfect for us. With 2 bedrooms, 3 baths, a nice living room, a full kitchen, and 3 balconies, the space was absolutely perfect! The pool and beach at the resort were very nice and the location was wonderful. Awesome property. Stayed here several times. This is an absolutly wonderful property. We stayed here three times now. Excellent location. Great for family. I would highly recommend this property. We will hopefully renting again soon. Nancy's vacation rentals are located within the Elysian Beach Resort on Cowpet Bay Beach on the highly desirable East End of St. Thomas, USVI near the village of Red Hook between the Ritz-Carlton and the St. Thomas Yacht Club. I now have multiple vacation rentals at the Elysian Beach Resort on Cowpet Bay Beach, all of which have been upgraded with new kitchens, bathrooms, cabinetry, and air conditioning. From Beaching, scuba diving, snorkeling, SNUBA, ecotours, sailing, yachting, powerboating, submarining, rafting, jetskiing, parasailing, kayaking, horseback riding, parasailing, duty free shopping, dining (an abundance of excellent restaurants on the island), drinking, fishing, golfing, and tennis ... to visiting Paradise Point, Coral World, the St. Thomas Skyride ... to sight seeing (guided or unguided tours) ... to getting married ... or just relaxing on the condo deck and enjoying the view of the Caribbean Sea. There is a LOT to do on the islands. Although there are plenty of things to do right on the island of St Thomas USVI, the great thing about being on the East End of St Thomas is that you have the ability to easily get off St Thomas to explore St Johns and the British Virgin Islands! Having been to St Thomas many times, the following remain my favorite things to do. They are not to be missed! Visit Trunk Bay Beach on St Johns to relax and/or snorkel. To get there, take the Red Hook ferry to St Johns and then grab a cab to Trunk Bay beach. Take your rental jeep on the car barge (to the left of the ferry terminal) to explore the island of St. John's. Visit the remote beaches on the far side such as Lampshur Bay. Eat at a roadside restaurant. Rent a powerboat w/Captain in Red Hook and head out to Jost Van Dyke. The captain will help you with the best method to clear British customs. Visit Soggy Dollar Bar and enjoy a Painkiller #5 in White Bay. While there, also visit Ivan's Stress Free Bar and play bartender. Then hop over to Great Harbor to visit world famous Foxy's for another Painkiller! If you have time, get your captain to take you to Little Harbour and enjoy a meal at Sidney's Peace and Love. Make a day of Jost Van Dyke. Have a Banana Daiquiri at Mountain Top on St. Thomas or enjoy an Adult Flavored milkshake at Udder Delight at the St. Thomas Dairy. Red Hook is the place to go if you are looking for an evening of fun. This is where you will find the island-style party vibe that captures the whole block. This area offers lots of variety and many options in the way of nightlife. If bar-hopping is your style, this is a stop you don’t want to miss! Check out Duffy's Love Shack - located in Red Hook Plaza parking lot opposite the Ferry dock. All beaches in the Virgin Islands are open to the public. Non-hotel guests can usually rent chairs and water sports equipment at beach resorts. There are a LOT of great beaches on St. Thomas. Out of the 44 beaches on the island, I prefer the beaches that have decent snorkeling, with a bar that serves Painkillers, and iguanas sunbathing. The beach that is right in front of the vacation rental is Cowpet Bay Beach and is a favorite with frequent island travelers. For your first vacation to the USVIs, I recommend that you limit your island hopping to St. Thomas, St. John, and Jost Van Dyke. It will be all you can do to see and enjoy these islands. After visiting the islands many times over the years, I still enjoy these islands the most. You will need to visit Tortola to clear British customs in order to go to Jost Van Dyke. While you are in Tortola, it is worth having drinks and lunch at Pusser's Landing. I HIGHLY recommend you book a boat through John at St Thomas Boat Rental. We, the owners, have rented with him multiple times while in St Thomas and had a fantastic time. John took eight of us wherever we wanted to go and gave us a history lesson along the way. He even picked us up right at the Elysian Beach Resort on Cowpet Bay Beach. We just packed a cooler. He provided snorkel equipment on the boat. St. Thomas Boat Rental offers you a private boat for the day or half day. Sit back, relax and enjoy the ride while St. Thomas Boat Rental’s captain handles the rest. Enjoy the beauty of the Virgin Islands at your pace, on your schedule with St. Thomas Boat Rental. Walk across the street from the Elysian Beach Resort and set sail aboard The Ritz-Carlton, St. Thomas' own catamaran, the Lady Lynsey, offering day snorkel sails and sunset sails. Or, enjoy one of the many charters available at the American Yacht Harbor in the village of Red Hook on the East End of St. Thomas, where you can discover the beauty of the Caribbean Sea as you explore white-sand beaches and snorkel through live coral reefs or 'The Caves' of Norman Island. There are several island-hopping party destinations that are worth the trip such as any of the many bars on White Bay on Jost Van Dyke; generally rated G - Mild-to-Wild drunken behavior. Half the rental fee is due upon the signing of the rental agreement, remainder of the rental fee will be due 60 days prior to your arrival. Reservation guaranteed upon receipt of rental agreement and fee. Hurricane guarantee at all times. Call for discounted rate if you only need one room.